Whether you just completed a tough workout at the gym (or spent the entire time laughing at cat memes), it can feel like absolute bliss to cap off all that hard work with a much-needed session in the steam room or sauna. Known for benefits that include improving circulation, detoxifying the body, and lowering stress, both wet and dry saunas are good for the body and might even have you feeling like royalty (did we mention that Meghan Markle squeezes in a weekly sesh?). However, there are a few things you need to know, including the safety risks and exactly how long you should aim to stay in. Be sure to follow these tips to continue enjoying your post-workout/post-cat meme sauna routine. Due to health risks, which include fainting or heat stroke, experts generally recommend staying in a sauna for no longer than 12 to 20 minutes. After that, you should exit the sauna and let your body cool down for at least 20 minutes. This could include dunking yourself into a cold pool. Otherwise, just sit at room temperature. 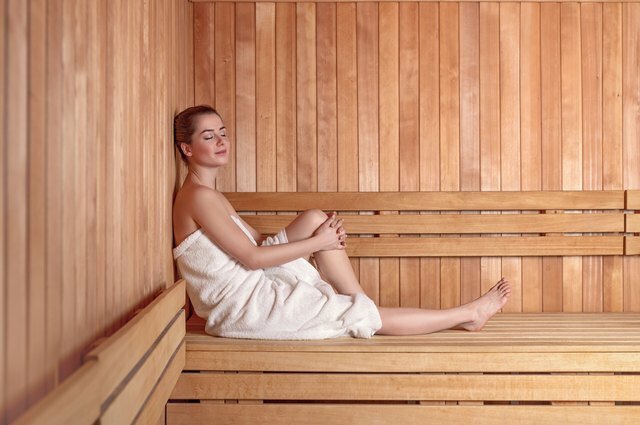 If you feel like your body can handle another session after the 20 minutes are up, then you can return to the sauna for another 12 to 20 minutes. Depending on how you feel after another break, you may be able to go back for a third time. To achieve the most Zen sauna experience possible, be sure to follow these best practices. For example, to find your sweet spot in a sauna, keep in mind that the heat rises. This means that the top bench provides a hotter atmosphere than the bottom bench. 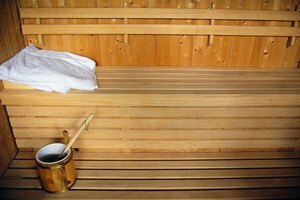 If you're new to the sauna experience, you should sit on the lower bench until your body builds up a tolerance to the heat. Every time you leave the sauna, take in some fresh air, shower and then dry off. Lastly, always, always, always, hydrate afterward. Aim to drink at least eight ounces of water right away to make up for the sweat you lost. Although the 12- to 20-minute time limit is a general rule, it's extremely important to be conscious of your own body while sitting in a sauna. For some, 12 minutes may even be too long. If you begin to feel overly tired, nauseous, dizzy, or uncomfortable in any way, you should leave the steam room immediately. Sit in an area with fresh air, and drink plenty of fluids to rehydrate and bring your body back to a normal temperature. If you have any health conditions, you should absolutely speak with your physician before hitting the sauna. With these tips in mind, you will be leaving the sauna feeling refreshed and relaxed in no time.